Thaolam Ngo and Tin-Tin Patana-anake built a wireless power system for left ventricular assist devices for heart disease patients. UW ECE capstones are the culmination of a student’s electrical engineering education. At the end of the academic year, students present their projects to peers, industry professionals and faculty in our Capstone Fair. Our second annual Capstone Fair featured nearly 40 projects. For more on the 2018 fair, read our spotlight article. 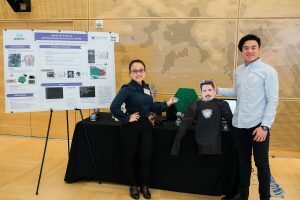 At our inaugural Capstone Fair, more than 30 projects were presented, addressing issues on health, the environment, power and energy, and technology. The award for best capstone project went to the Booz Allen Hamilton OceanLens team of Will Butterton, Yicheng Wang, Justin Skubic and Jared Nakahara. For more on the 2017 fair, read our spotlight article.